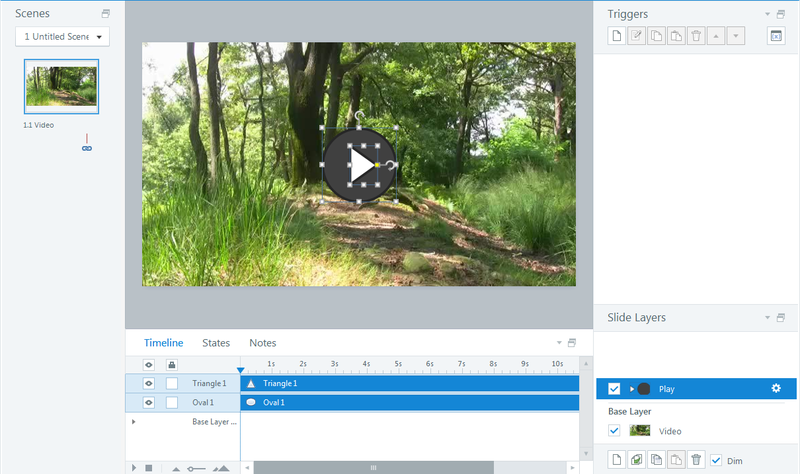 Ever want to add a Play button to the center of your video to encourage learners to click on it? If you’re like Community member Katerine Girard, the answer is yes. She started a discussion on that very topic a while back, which inspired me to try it out in Articulate Storyline. Here is a link to the published version. Like it? Follow these five easy steps to create your own! Start by inserting your video onto the base layer of your slide. 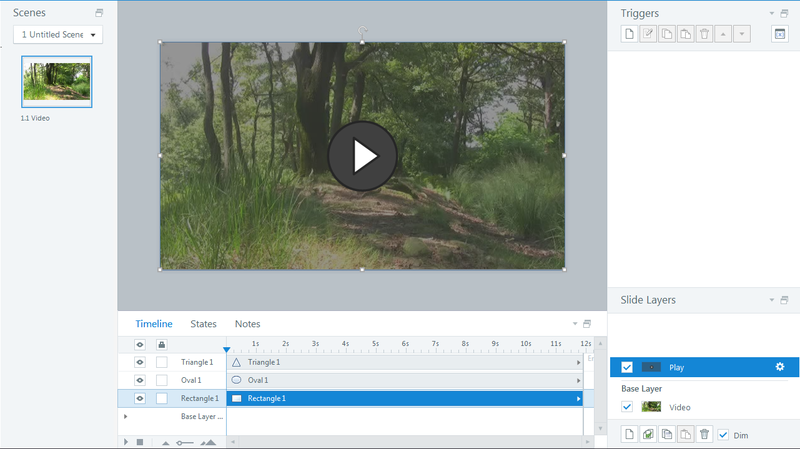 Storyline accepts most video formats by default, so you don’t have to worry about converting it. Next, add a new slide layer and name it—for example, let’s use “Play” as its name. 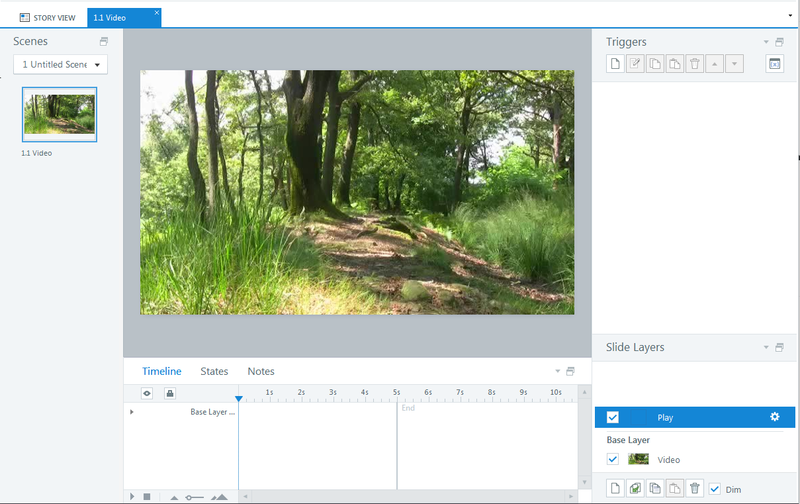 Now it’s time to create the Play button on the play slide layer. If you already have an image, go ahead and insert it onto your slide layer. If you don’t have one, it’s a cinch to create. Simply insert a circle, then a triangle, and group them together. Have you noticed how sometimes when you pause a video, it becomes dimmer? This technique used to signal to viewers that the video was, in fact, paused. 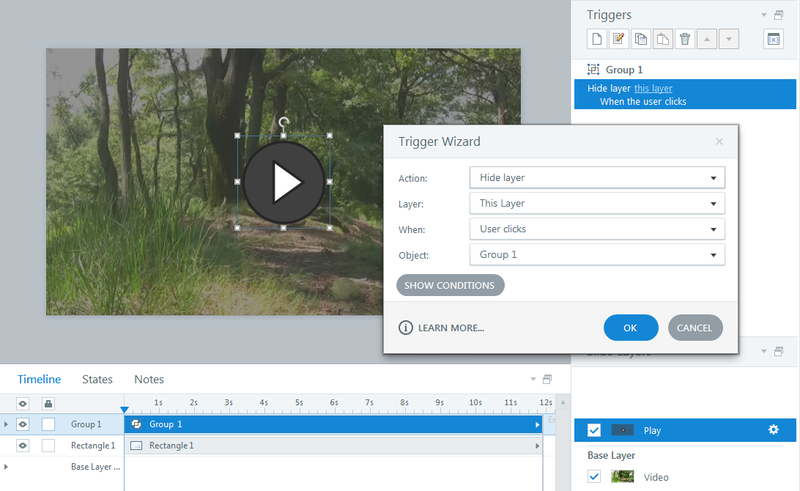 To create this effect in Storyline, all you have to do is add a rectangle across the entire slide layer and adjust the transparency settings. In this example, I’ve used a dark gray color with 44% transparency, but you can use any color and transparency settings that you want. Once you’ve adjusted the transparency settings to your liking, go to your timeline and drag the rectangle to the bottom so that it is behind your Play button. 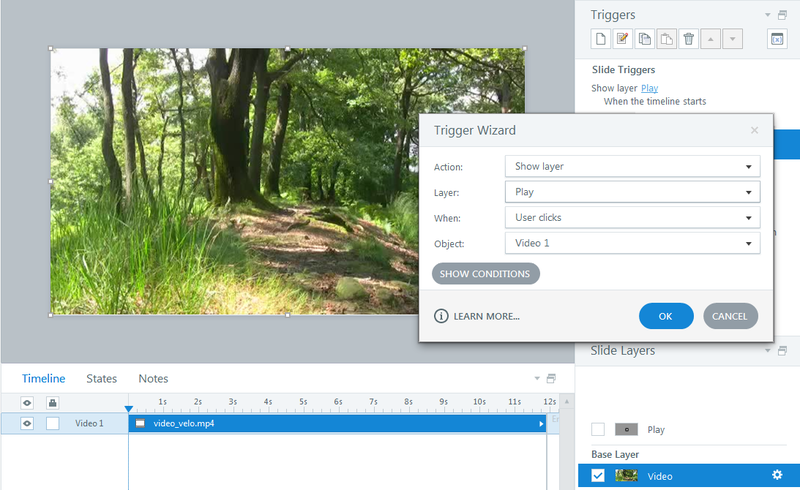 With your play slide layer in place, it’s time to add a couple of triggers on your slide layer. 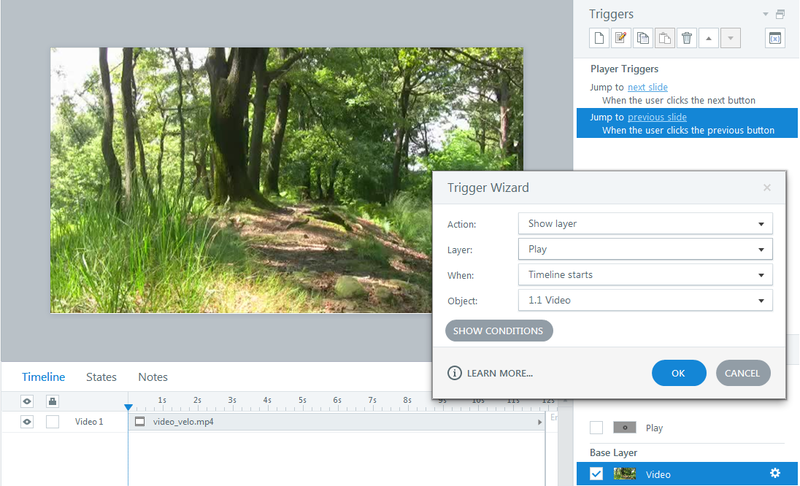 Start with two triggers for your Play button: Hide This Layer and Play Media when User Clicks. Now, go back to the base layer, where you should add three triggers. 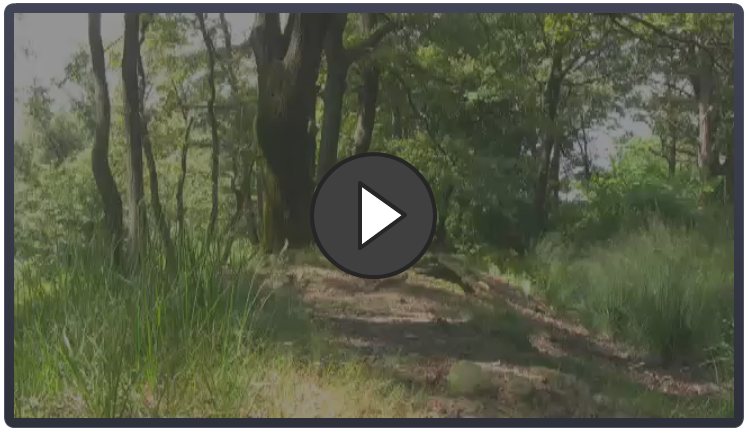 Set the first one to show the Play layer when the timeline starts, so the Play button appears when the learner views the slide. 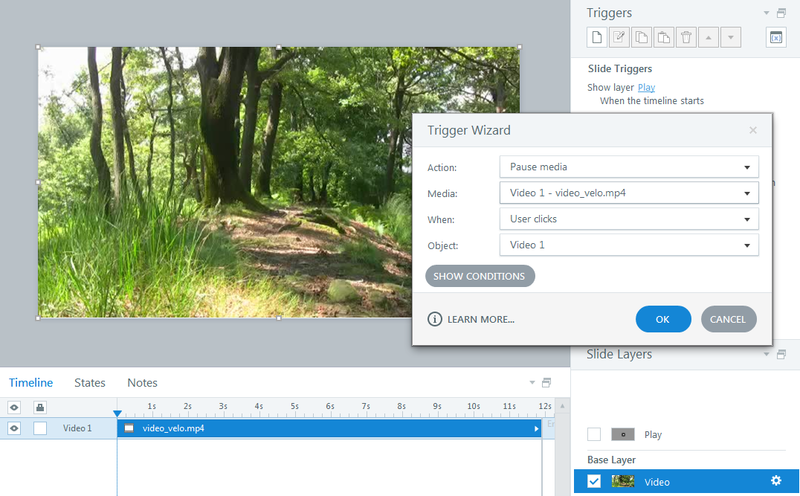 Then, select the video and add two more triggers: Pause Media (first image below) and Show Layer (second image below) When User Clicks. That way when the learner clicks on the video, it will be paused and the Play button will display on the screen. In writing this, I think it takes longer to explain it than to actually set it all up! Do you have tips for adding a Play button to videos? Leave a comment below to share your experience. 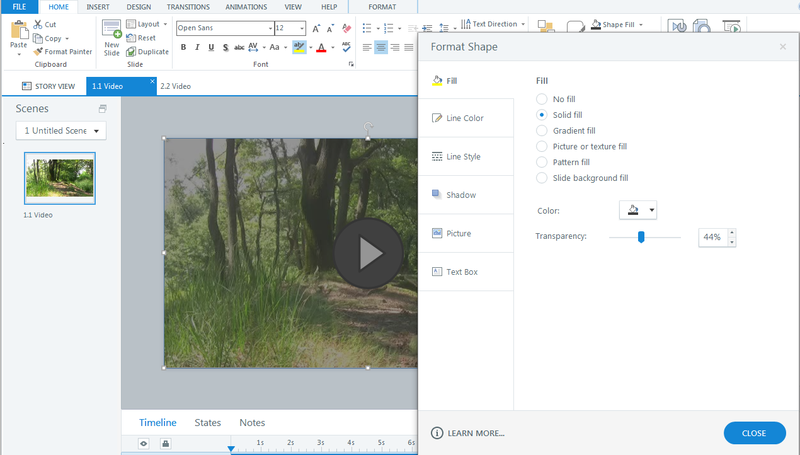 Want to give it a try, but don’t have Articulate software? No problem! Just download a free trial. Don’t forget to come back to E-Learning Heroes regularly and follow us on Twitter for more helpful advice on everything related to e-learning. I've done something similar with audio, but using two buttons (although it looks like one). Play button has 3 triggers: - play media - hide play button - show pause button Pause button has another 3: - pause media - hide pause button - show play button The effect is that when you click play, the button changes to a pause button and the media plays. I did it as two buttons because I wanted to use down and hover states on the buttons. If you don't have those you could probably do this with two states of a single button. That was the first approach I tried, but I didn't have any luck. I wasn't able to determine the problem at the time (I was on a deadline), but I think it had something to do with a known issue where you can't use triggers with conditions to change the state of objects. 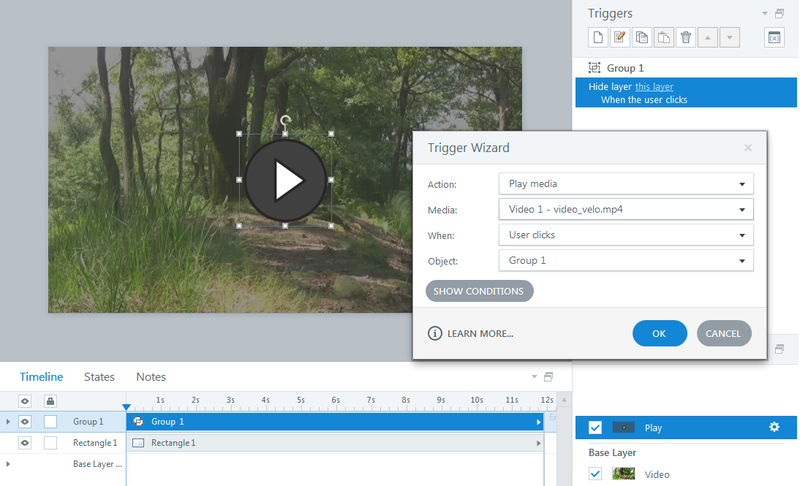 I believe I used triggers like this: If user clicks and state is "playing" ->pause media -> change state to "paused" If user clicks and state is "paused" ->play media -> change state to "playing"
I have done this, and quiet proud that I figured it out with 3rd day in using storyline. The problem I have is that the pause button shows up first. Once I click it, the play button shows up and the rest operates normally. Instead of Pause-> Play -> Pause-> Play-> Pause. I want Play-> Pause -> Play -> Pause. Can anyone offer a solution for this? It's hard to help you without having a look at your project. Can you create a new discussion in the forums, attach your project, and then share the link here?